Why shouldn’t the furry members of our family eat as well as the rest of us? We recently added a new dog to our family and we did the standard purchasing of new toys and treats for him. But as I was looking at the fancy, locally made dog treats, I realized that I could make these myself and for a lot cheaper. Plus, no preservatives or anything funny going on here. The pumpkin and peanut butter are healthy for your dog and he’s going to love them. These are actually pretty easy to make. Don’t be intimidated by rolling them out and using cookie cutters to make cute shapes. They roll out lots easier than people cookies, because they don’t have any fat in them. BUT, if you just can’t do the rolling out, you can roll the dough into a log and slice them to make round cookies. You can also make balls and smoosh them with the palm of your hand. There are lots of options here. Because of the lack of preservatives, these will only keep on the counter for about 3-5 days. I store mine in a baggie in the freezer and pull them out as we need them. The recipe is also pretty flexible – only 5 ingredients. You can eliminate the chia seeds or sub them out for flax seeds. You can also sub out the wheat flour, depending on your dog’s needs. My fancy grain-free treats from the store use chickpea and oat flours. 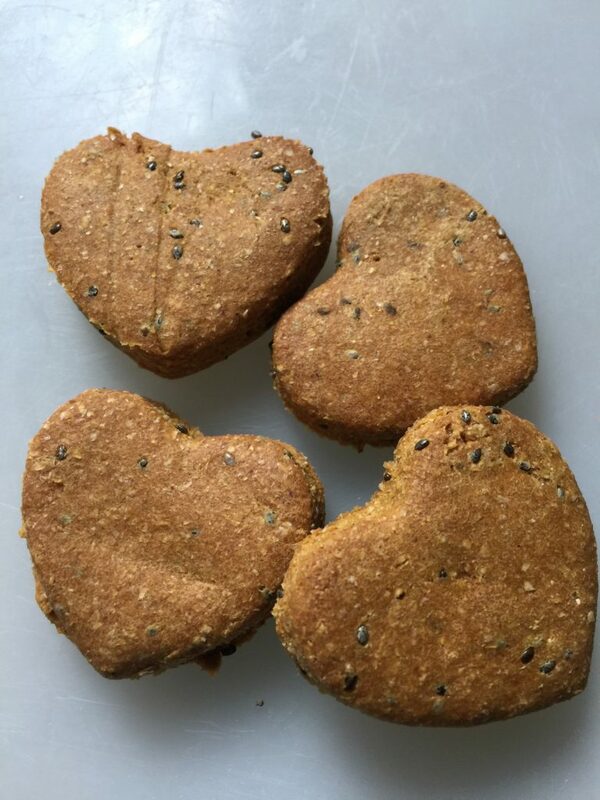 Your dog will love this super easy recipe for doggie treats. Add chia seeds and 2½ cups of flour. Mix until combined. Add remaining flour by ¼ cups until the mixture is good for rolling out (forms a nice ball that is not too sticky and doesn't crumble apart). Roll dough out to ¼ inch thick, cut with cookie cutter of choice. Bake in 350 degree oven for 20-30 minutes until slightly browned and as crispy as you (or fido) like.